Rectangular tabletop is designed for use with Balt Lumina Tables and features an antimicrobial finish that inhibits the growth of mold, mildew and fungus on the product's surface. The 1" thick top flips back with a simple lever mechanism, allowing the tables to be nested for storage. 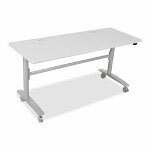 The steel frame base is sold separately and is equipped with 3" casters, two locking, so the assembled table can be rolled easily out of the way.